America’s Premier Prescription Savings Program: Our cardholders have saved over $1 billion on their prescription drug purchases! The Eazy Scritps Rx savings program is one you can trust; with thousands of participating pharmacies nationwide, you’ll get the best possible savings and our commitment to your health and well being. There is no cost to you, and the card never expires. Prescription Savings For The Whole Family! Save on both generic and brand name drugs at over 64,000 nationwide pharmacies! Card valid for entire family. We have made it super easy for you to save with your mobile device. If you don’t want to carry a card in your wallet, download the card to your phone and show your screen to the pharmacist. It’s that easy to save! "I saved $41.98 on my first and $14.06 on my second thats 30% respectively." "The normal price would have been twice as much as we paid, Thanks!" "I saved 60% my first time, I can't wait to see what I save next time!" 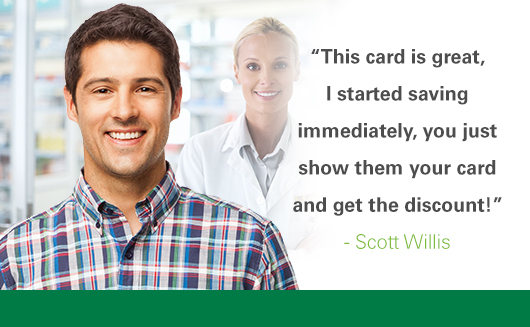 "I saved over $80 on my first three prescriptions, and have two more to go!" "I never expected this much savings, they checked the price three times." "I was skeptical at first, than I gave it a shot, it's the real deal!"